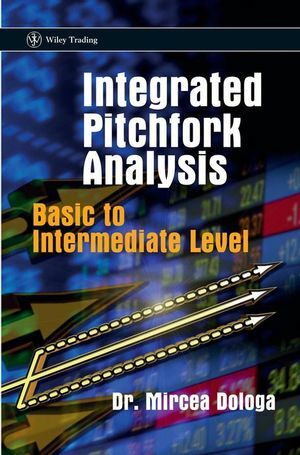 Integrated Pitchfork Analysis: Basic to Intermediate Level is an introductory text to the branch of Technical Analysis which uses the Andrews' pitchfork trading technique. Designed for traders with no experience of Pitchfork Analysis this book demonstrates how to analyse the markets and trade using pitchfork analysis, assisting the novice trader in achieving a consistent performance. Written by experienced trader, Dr Mircea Dologa, founder of www.pitchforktrader.com, the book begins by introducing and discussing the basic theory of pitchfork trading, providing a description of the technique, how to analyse the charts and how to make a decision based on that analysis. It then moves on to the more practical aspects about the low risk high-probability trade from its inception to its termination. Crucially expert guidance on money management and risk management techniques - when to get in, when to get out and where to locate the initial or trailing stops is also provided. Ultimately Integrated Pitchfork Analysis: Basic to Intermediate Level will teach you how to trade, how to follow the markets and how to consistently make money. Chuck LeBeau, Director of Quantitative Analysis for SmartStops.net and co-author of Computer Analysis of the Futures Market, noted trader, lecturer and trading systems developer. Tony Plummer, Director, Helmsman Economics Ltd. Dawn Bolton-Smith, Founder-Member of the Australian Technical Analysis Association, Senior Technical Analyst, Educator & Writer. "Dr.Mircea Dologa has masterfully defined and delineated the Median Line procedure that is central to Pitchfork Analysis and trading. His basic and intermediate theory and practice is a definitive work in this important realm of technical market analysis." Professor Oliver Henry Pruden, Professor of Business Administration and Executive Director of the Institute for technical Market Analysis, Golden Gate University, San Francisco, USA. Dr Mircea Dologa, Paris, France is a multi-million dollar real estate owner and began his investment and trading career in the pharmaceutical and real estate industry. He is a Commodity Trading Advisor and contributes to international trading magazines. He has a B.S in theoretical physics and a doctorate in Medicine from the School of Medicine in Paris. He has an MBA from HEC in Paris. After holding the position of general manager in the pharmaceutical industry, he left in 1992 to focus exclusively on his investments. 1. The Birth of Pivots and the Pitchfork. 1.1 Defining the Market Context and its Limits. 1.2 Pivots: Definition, Characteristics and Function. 1.4 Creating Pivots: Case Studies. 2.2 Kinematic Study of the Pivot. 2.3 Kinematics of the Pitchfork Embedding the Global Market. 2.4 Pivot Choices: Case Studies. 2.5 Penultimate Pivots of an Ending Correction: Case Studies. 3. The Magnetic Power of Median Lines. 3.1 Magnetic and Symmetrical Axis Power. 3.6 Median Line-related Market Strength or Weakness: Double Six Parameter Rules. 3.7 Other Functions of the Median Line. 3.8 Using the Median Line: Case Studies. 4.1 Definition, Characteristics and Function. 4.3 Inside Mini-Median Line: Horizontal Orienation. 4.4 Inside Median Line: Oblique Orientation. 4.6 Mini-median line with steep downsloping ML. 4.7 Mini-median line with a twin pivot ML. 5.1 Definition, Characteristics and Function. 5.2 Warning Lines: Case Studies. 6.2 The Hagopian Rule and Line. 6.3 The Trigger Line as a Border Line. 6.4 Variability of the Trigger Lines Quantifies the Trade Risk. 6.5 Trigger Lines: Case Studies. 7.2 Price Behaviour and Sliding Parallel Lines. 7.3 Parallelism Criteria of Sliding Parallel Lines. 7.5 Sliding Parallel Lines: Case Studies. 8.2 The Degree of the Slope. 8.6 Redrawing a Trend Line. 8.7 Confirming a Trend Line. 8.9 Breakout Efficiency of a Trend Line. 8.10 Money Management and Trend Lines. 8.11 Unorthodox Trend Lines: Case Studies. 9.3 Kinematics of Multiple Pitchforks as Integrated Patterns. 9.4 Multiple Pitchfork Integration: Case Studies. 10. Schiff Pitchforks and Affiliates. 10.2 Constructing the Schiff Pitchfork. 10.3 The Efficiency of the Schiff Pitchfork: 1. 10.4 Efficiency of Schiff Pitchfork: 2. 10.7 The Reverse Pitchfork: Building the Future. 11. Action and Reaction Lines. 11.1 Definition and Historical Foundation. 11.5 Constructing Traditional Action and Reaction Lines. 11.6 Constructing Gap A&R Lines: Image Mirroring Technique. 11.7 A&R Lines and the Price Translation Across the Market Slots. 11.8 Constructing Double A&R Lines: Criss-cross Pattern Technique. 11.9 Constructing Double A&R Lines : Symmetrical Pattern Technique. 11.10 Pre-close Breaking-Up/Down Trend Lines. 11.11 The Straight Pivot Alignment Pitchfork. 12. The Gap Median Line. 12.2 Building the Pitchfork with a Gap Median Line. 12.3 Multiple Gap Median Lines and Other Chart Patterns. 13. Breakaway and Runaway Gaps. 13.2 The Gap Context and the Systematized Visualisation Tool. 13.3 Gap Mechanisms: Foundation and Development. 13.4 Array of Tradable Gaps. 13.5 Trading the Island Reversal. 13.6 Gap Trading: Gap Median Line versus A&R Lines. 14.1 Definition and Brief Historical Basis. 14.3 Fibonacci Price Ratio (Horizontal) Lines: Case Studies. 14.4 Dynamics of Integration: Pitchfork and Fibonacci Price Ratio (Horizontal) Lines. 14.5 Dynamics of Integration: Pitchfork and Fibonacci Price Ratio (Oblique) Lines. 15.2 Double Line Intersection Confluences: Case Studies. 15.3 Multi-level Line Intersection Confluences: Case Studies. 15.4 Multi-zone Confluences with Multi-level Line Intersections: Case Studies. 16.2 Mirror Bars: Case Studies. 16.3 Mirror Bars and their Pitchfork Applicability: Case Studies. 17.2 Micro and Macro Aspects of Energy-building Rectangles: Case Studies. 17.3 Measuring Techniques and Energy-building Rectangles: Case Studies. 17.4 Mapping the Context and Local Market: Case Studies. 18. The Pitchforks’ Journey Through Multiple Time Frames. 18.2 Multiple Time Frames and Fractal Geometry. 18.3 Multiple Time Frames and Photographs from Space: An Analogy. 18.8 Operational Time Frame: the 60-minute Time Frame. 18.9 Multiple Time Frames and Pitchforks: Practical Aspects. 19. Case Studies and Money Management. 19.1 Zoom and Retest Technique: After a German Dax Energy Building Rectangle. 19.2 Zoom-and-Test Technique: ES Energy-Building Rectangle and Trigger Line. 19.3 Zoom-and-Test (Entry) and Retest (Add-on) Technique. 19.4 Zoom-and-Test Technique: German Dax Median Line. 19.5 Breakout of the Narrow Range: German Dax Median Line. 19.6 Homework for the Reader: Spotting and Managing a Trade. Appendix I: Historical Basis: Using the Concept of the Pitchfork as a Tool. Appendix II: The 80:20 Percent Rule. Appendix III: Bibliography and References. Appendix IV: Contents of Volumes II and III (in preparation).